Purty Little Thing: I did it! I have become a builder!!! I can't believe how long it took me to start doing this! it's fun and MUCH more easy then I thought it would be! Also, sculpties are MUCH more easy to use then I ever thought they would be! Here's the second house I made! 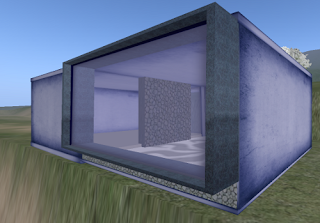 It's called Blue and Grey and it's helped me learn a lot about working with prims and textures. If anyone wants a free copy (it's only like 17 prims, or so, and has 2 rooms), hit me up in-world, I'll be happy to share! Speaking of sharing, my nephew just shared something with me, and I'm gonna share it with you, try saying "toy boat" three times real fast. Let me know your results!